Since I'm not sure whether the way I intend to store the level data for my next game is efficient enough, I wanted to ask whether there is any known information of specific games and the way they store their levels. How is, for example, the overworld stored in ROM? Do they save two bytes (x/y and meta tile) for each and every 16 x 16 tile on the screen or do they have other ways of doing this? I assume they don't save 16 x 11 bytes for every screen to store every 16 x 16 area uncompressed. If a game has been hacked, RomHacking.net may have a document describing its map storage format. See The Legend of Zelda on Data Crystal and List of The Legend of Zelda hacking docs. I seem to remember The Legend of Zelda using a metatile scheme involving repeating entire 16-pixel-wide vertical strips of the map. I know Super Mario Bros. generates attribute data from the metatiles. Link's Awakening starts with one of several templates (such as a closed room, a room open on one side, a grassy field, etc), and then uses a string of commands to define the contents of the rooms. IIRC, you lay down rectangular regions of objects in sequence (bushes, water, grass, walls, etc), or you stamp down individual objects like chests and switches. I would take a look at whatever it is Alp is doing here. Those are some impressive compression ratios! This came to mind for me, as well. 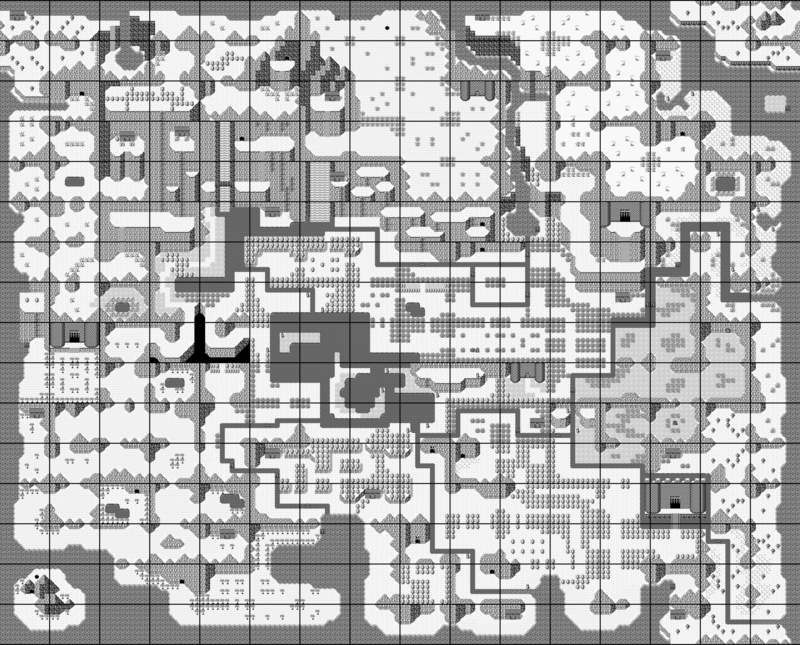 That post is a great example of how to represent Zelda-esque map data in an efficient way. Yeah, it's true: "Zelda" has a bit less than 256 meta sprites which are all 16 pixels wide and 176 pixels high, i.e. the whole height of the playfield. So, each screen takes exactly 16 bytes. I.e. each meta sprite on the screen consists of an x/y position in one byte and the meta sprite index in the next byte. This might not be so efficient if I try to put every tree and every rock on the screen individually. But it's possible to use some larger meta sprites. For example, six trees in a rectangle of 3 x 2 could be their own meta sprite. Memory is cheap now so unless you are exceeding what your mapper supports then I wouldn't worry about being extremely efficient. If you can guess how many screens worth of data the game will use then you can get an idea of how much memory you need. As you saw Zelda uses predefined vertical strips of tiles to make up the overworld and save memory. And the underworld uses predefined room types. However when BS-Zelda was developed for the Super Famicom, the map data actually is stored as a grid of 16x16 pixel tiles and not compressed. Why compress the data or use tricks if you have the memory to fit it? So I'd suggest only going so far that it's comfortable and you can do what you want but it still fits into your memory budget. Now, but not at the time of the NES. And I don't plan to use a custom mapper. Even though I will get the cartridges produced from scratch, I will create a game that could go on a common donor cartridge, so that people can reproduce it if it becomes freeware. In my case, I will probably use UNROM. ROM memory: I'll have to check how much the most common UNROM games had. Dungeons: Maybe so that we have the same size as the overworld, but I probably won't implement a separate rendering method for dungeons, like "Zelda" does with its walls and doors. Dungeons in my game will use the same storing method as the overworld, only that they refer to different meta sprites and the graphics tiles are of course different ones than in the overworld. The game will be a bit story-heavy. So, apart from the level data, there will be a lot of space needed for dialogs. Because I want to create an ongoing storyline (like in "Final Fantasy Adventure", only on a smaller scale), not the static world of "The Legend of Zelda". I'll have to check how much the most common UNROM games had. UNROM is 128KB, UOROM (which works the exact same way and has the same mapper number) is 256KB. There's a 512KB extension that has been used for homebrew before. You can fit a lot of screens in 512KB even if you don't use the most optimal compression ever. Personally, I wouldn't worry about compression so early in development... It's better to start with something straightforward and focus on the engine, IMO. UNROM is 65536 or 131072 bytes; UOROM is 262144 bytes. But because the stock UNROM board doesn't support WRAM, you have to pack the entire mutable state into roughly 1536 bytes (assuming stack, VRAM transfer buffer, and OAM transfer buffer are 512 bytes). You also have to either make your game one sitting long or squeeze the entire campaign's state into 48 bits or less for a practical password save. Two possible extensions to UNROM are adding WRAM using a circuit like that in Family BASIC or making it self-flashable to treat the first few sectors as a log-structured file system. MMC1 SNROM is 32768, 65536, 131072, or 262144 bytes, and includes 8192 bytes of WRAM. But bankswitching is slow because it uses a serial protocol to save three input pins. The smaller your level format, the less often you have to bankswitch. Yeah, the mapper details are something that I take care of later. In the moment, I'm in the middle of experimenting with the scrolling and screen loading stuff. When this is finished and I can also show a dialog box with text, then I'll take care of learning about the mapper. The reason why I care about compression now is because that's directly related to loading the screen: When the next screen is put into memory before the scrolling starts, I need to load data from ROM, extract it and see how long this takes. That's why I need to take care of the compression now. Normally you'd abstract these layers... If you already know the basic unit that composes your map (16x16-pixel metatiles?) then you can already test how much memory you can use to buffer those and how long it'll take for you to blast them to VRAM. That's part of the video system, and this system shouldn't really care where the metatiles are coming from, as long as they're put in the buffers. Similarly, the map/scrolling system should only care about filling the buffers with data. Early in development, you can easily use uncompressed maps and fill the buffers just by copying data, and once you have some of the game working, you can try different encoding methods and finish up the map/scrolling system. This way you'll not only have a working prototype sooner, but you'll also not regret any encoding decisions you make now in case you decide to change something after testing the gameplay. This is just a suggestion, from someone who's used to overthinking details like this and taking forever to get to the good stuff, you're free to ignore it of course, this is your project after all. Sure, my function that writes everything to the PPU in vblank doesn't care. It gets only raw data from an array. But the preparation function that fills the array during game logic is different: If I do lines like in "Zelda", I have a constant rate of PPU updates. If I do two-dimensional meta sprites of variable size, the update size can vary and I have to include status variables to check whether the next meta sprite can still be included into the PPU update buffer array. And if not, the corrent position of the extraction needs to be saved until the next frame, so that the correct next meta tile gets read when the next frame appears. In the moment, I'm only experimenting with separate features anyway. I'm not doing anything of the game itself yet, like character movement etc. My current program is only a tech demo to try out all the stuff that will be necessary for the game. The actual game development will probably not start before the second half of 2017. So, don't worry. I know what I'm doing and I know what I want. I implemented filling the complete off-screen name table with a single tile. Now it's compressing sample data and filling the PPU from the compressed ROM data. Then vertical scrolling with updating the currently visible screen piece by piece. Then adding color attributes to all the previous stuff. Then some consideration how to hide the artifacts during vertical scrolling. Then comes drawing and disabling a dialog box to the other name table on demand. Then I implement the raster effect that when a dialog box is active, that the name table with the dialog box is rendered and afterwards, we switch back to the regular name table that holds the currently active screen. And then comes the mapper stuff.